The long-established prospect brand highlights the next batch of rising MLB stars in 2018 Panini Elite Extra Edition Baseball. Tweaking the formula from 2017, each Hobby box should average eight autographs and two memorabilia cards. The EEE set also has Panini-exclusive players from the Dominican Prospect League. Covering top prospects and 2018 draftees, the 2018 Elite Extra Edition base set is limited to 999 copies. Further increasing the rarity are the Aspirations parallels, including Red (#/150), Orange (#/100), Blue (#/75), Tie-Dye (#/25) and Gold (1/1). In addition, the Status die-cut parallel adds Red (#/99), Emerald (#/49), Tie-Dye (#/25) and Gold (1/1) editions. The numbered parallels average one per pack and five per box. With eight signed cards per Hobby box, on-card autographs anchor the 2018 Panini Elite Extra Edition Baseball checklist. These hard-signed editions come in the main Autographs insert in a base version and as many as 14 parallels. 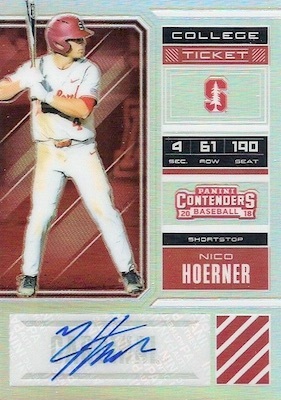 Playing off the popular Rookie Ticket line, the College Ticket Signatures (#/99 or less) insert highlights top prospects from their collegiate days. 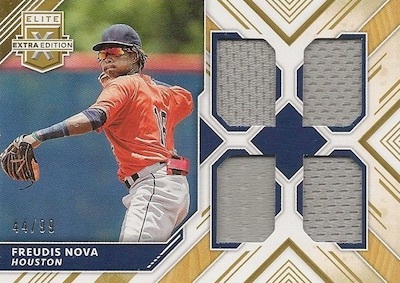 Parallels include Holo (#/25 or less), Gold (#/10 or less) and Gold Vinyl (1/1). 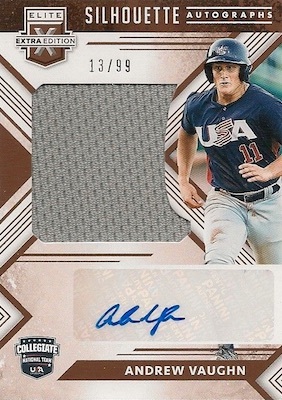 Other 2018 Panini Elite Extra Edition Baseball autographs can be found in USA Collegiate Silhouette Autographs and National Team Signatures, which also offers 18U and 15U players. The Future Threads Silhouette Autographs (#/299 or less) insert pairs a signature and relic for up-and-coming stars. These have Gold (#/99 or less), Red (#/49 or less), Purple (#/25 or less), Emerald (#/10 or less), Blue (#/5 or less), and Holo Silver (1/1) parallels, as well. Combining to supply two per Hobby box, the 2018 Elite Extra Edition relic offerings feature a few different choices. 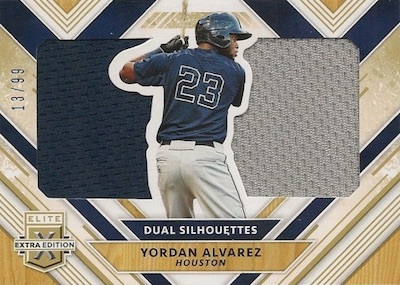 The all-new Dual Silhouettes cards contain two large swatches for a single prospect. Triple Material (#/399 or less) naturally goes a step further with a trio of memorabilia pieces per card. Parallels include Silver (#/149 or less), Gold (#/99 or less), Red (#/49 or less), Purple (#/25 or less), Emerald (#/10 or less), Blue (#/5 or less), and Holo Silver (1/1). 2018 Panini Elite Extra Edition Sergio Campana Future Threads Auto ser# 5 NICE! 2018 ELITE EXTRA EDITION ORELVIS MARTINEZ TIE-DYE FOIL AUTO RC #’d 05 10! 200 cards. Serial numbered #/999. ASPIRATIONS PARALLELS: Red #/150, Orange #/100, Blue #/75, Tie-Dye #/25, Gold 1/1. STATUS DIE-CUT PARALLELS: Red #/99, Emerald #/49, Tie-Dye #/10, Gold 1/1. PARALLEL CARDS: Holo, Gold #/10, Gold Vinyl 1/1. PARALLEL CARDS: Emerald #/25 or #/15, Tie-Dye #/10, Printing Plates 1/1. ASPIRATIONS PARALLELS: Purple #/100 or less (No Tristan Beck*), Blue #/50 or less, Tie-Dye #/10 or #/5, Gold 1/1 (No Brennen Davis*). STATUS DIE-CUT PARALLELS: Red #/75 or less, Emerald #/25 or less, Tie-Dye #/5, Gold 1/1 (No Brennen Davis*). PARALLEL CARDS: Holo #/25 or less, Gold #/10, Gold Vinyl 1/1. 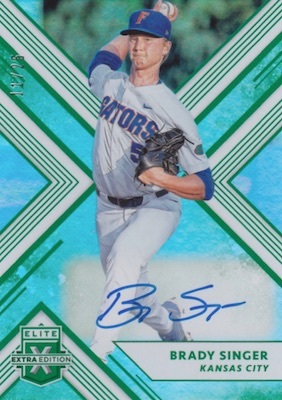 Buy 2018 Elite Extra Baseball autographs on eBay. PARALLEL CARDS: Blue #/10, Emerald #/5, Holo Silver 1/1. PARALLEL CARDS: Red #/100, Holo #/25, Gold #/10, Gold Vinyl 1/1. PARALLEL CARDS: Gold #/49, Red #/25, Purple #/10, Blue #/5, Holo Silver 1/1. PARALLEL CARDS: Red #/100, Blue #/25, Emerald #/10, Red/White/Blue #/5, Holo Silver 1/1. PARALLEL CARDS: Silver #/149, Gold #/99, Red #/49, Purple #/25, Blue #/10, Emerald #/5, Holo Silver 1/1. 3 base and 10 Silver parallel cards. 40 cards. All serial numbered to 99 or less. PARALLEL VERSIONS: Gold #/99 or #/49, Red #/49 or #/35, Purple #/25 or #/15, Emerald #/10, Blue #/5, Holo Silver 1/1. PARALLEL CARDS: Silver #/149 (No Baddoo*), Gold #/99, Red #/49, Purple #/25, Emerald #/10, Blue #/5, Holo Silver 1/1. PARALLEL CARDS: Silver #/149 (No Romero*), Gold #/99, Red #/49 (No Sheffield*), Purple #/25, Emerald #/10, Blue #/5, Holo Silver 1/1. PARALLEL CARDS: Silver #/149, Gold #/99, Red #/49, Purple #/25, Emerald #/10, Blue #/5, Holo Silver 1/1. View the full 2018 Elite Extra Edition Baseball checklist spreadsheet. Hey Trey will there be any longevity boxes of this product? Have not seen anything about Longevity boxes this year. 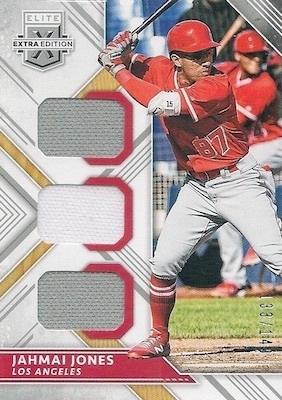 HEY TREY QUESTION NOT SURE IF THIS IS AN ERROR OR NOT BUT I GOT A JON DUPLANTIER QUAD JERSEY #ED65/99 BUT ON THE BACK WHERE IT SHOULD SAY 2018 IT SAYS 2017 BUT CAME OUT OF A 2018 BOX ANY EXPLANATION ? Likely just a mistake by Panini. I saw a bunch of the quad relics that also show 2017. Don’t mind this product but Panini was awfully lazy on it. Read the back of the cards. They basically copied and pasted stuff for players. 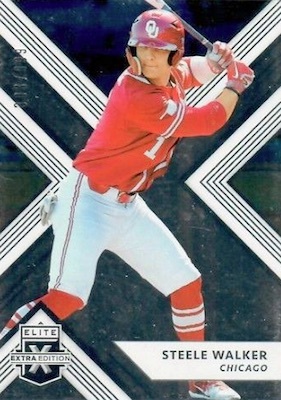 Do some research Panini on Minor League players and so forth. If not, stick to football and basketball and let Topps (Bowman) handle the things you’re too lazy to do. Hello Trey I have come across several tie-die auto that are not marked as as aspiration or status in the background. Is there a base auto tie-die parallel that’s that’s not in the checklist. 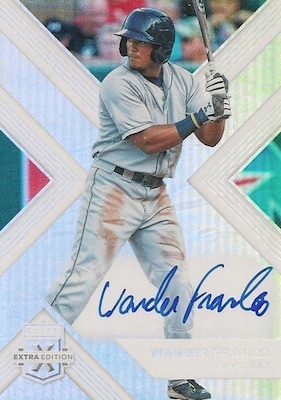 There are base autograph Tie-Dye parallels numbered to 10.